If you think you might know everything about the city of Worthington, now you have a chance to prove it. On June 13, Leadership Worthington will host The Hunt, a family-friendly way to explore Worthington, challenge your mind and get some physical activity at the same time. The event, which could be described as part scavenger adventure and part Amazing Race, is a signature fundraiser for Leadership Worthington. It aligns with the organization's mission to educate participants about the city's rich history while connecting them with local businesses and organizations. “We’re really looking forward to hosting this event,” said Jim Janosik, president of the Leadership Worthington Board of Directors. "We're always looking for ways to build relationships within the community and to introduce people to all that Worthington has to offer." Participants may enter The Hunt as a team of up to six people. At the beginning of the day, the teams will be given a clue book to aid them on their journey. Much like CBS’s hit show, The Amazing Race, the teams will solve clues that lead them to various places throughout the city. They then earn points by completing certain tasks. Teams may solve the clues in any order they choose, but some of the clues will be mandatory to complete. After 2 1/2 hours, the three teams with the highest number of points will be awarded prizes. As part of Leadership Worthington's ongoing affiliation with the Worthington school district and with numerous local organizations, participants may choose to register for the event through eight different groups, including the Old Worthington Partnership, the Worthington Historical Society and several local PTAs and clubs. Registering through one of these groups will earn you a spot in The Hunt—and a kickback for your organization of choice. Win-win! 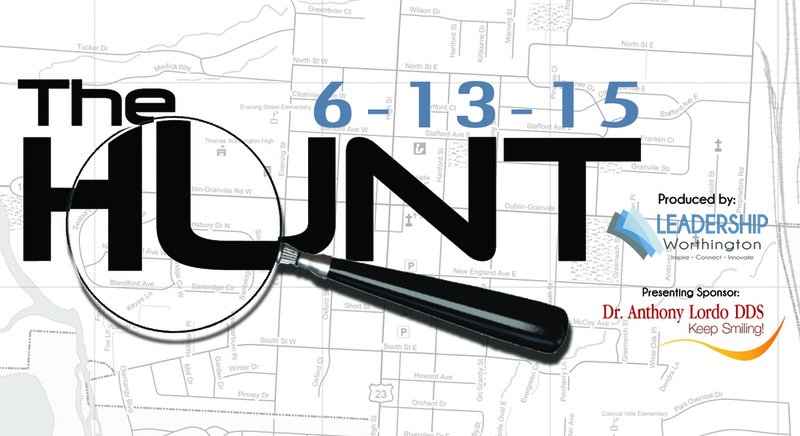 So whether you’re a history buff who can’t wait to share your knowledge of Worthington, or you're simply looking for a fun afternoon activity for the family, don’t miss The Hunt on June 13, 2015 from 1 to 3:30 p.m. For more information about Leadership Worthington or to get involved, visit www.leadershipworthington.org.